Learning how to drive is an event that teens look forward to, but young people are more likely to be involved in accidents than those who have been licensed for some time. The right kind of safety training can help teens be better informed and more responsible drivers. LoveToKnow interviewed Bill Wade, the national program director for Tire Rack Street Survival, a one-day program that provides young drivers with hands-on experience behind the wheel, giving them the skills needed to become safer drivers. LoveToKnow (LTK): Traditional driver education courses that offer a combination of classroom instruction and some time on the road don't seem to provide teens the skills they need to lower their risk of being involved in an accident. In what way is the Tire Rack Street Survival class different? Bill Wade (BW): A car traveling at just 4 mph has more energy than a bullet. That's a lot of responsibility and few people realize the power of the vehicle they are driving, especially teens and young, inexperienced drivers. 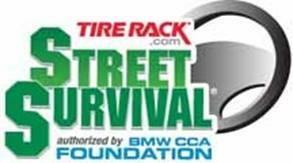 Tire Rack Street Survival goes beyond the fundamentals of basic driving and teaches useful skills that help young drivers when (not if) they find themselves in an emergency handling situation. We teach using correct vision and additional advanced techniques for proper situational awareness, ultimately helping to avoid accidents in the first place. In short, the Tire Rack Street Survival program teaches teens how to control their vehicle rather than operate it. LTK: Is the Tire Rack Street Survival program aimed at students who have already completed a driver's education program? BW: Although Tire Rack Street Survival allows students to take the class while they still have their permit, we aren't teaching them how to drive, we teach them how to drive better. Think of this program as a graduate school for drivers ed. A new driver who doesn't have at least 25 hours of driving time will find some of the things we do intimidating. We do not work on parallel parking or the issues in passing the state driving test; we put drivers to the test in real-world situations in a safe and controlled environment. LTK: What type of credentials do Tire Rack Street Survival instructors hold? BW: The coaches (instructors) have years of experience, having participated and instructed at driver education schools ranging from car control, winter driving or high performance driving schools. Many of the instructors have spent countless hours driving on race tracks and have enjoyed various disciplines of auto racing, rallying or competitive autocrossing. All of our instructors are volunteers from the BMW Car Club of America, Sports Car Club of America and the Porsche Club of America or other enthusiasts groups. Tire Rack Street Survival is not a speed event, but these coaches have been exposed to all levels of car control and have the ability to communicate their experience in a manner that gets through to teen drivers. LTK: How is the Tire Rack Street Survival program structured? What skills does it help young drivers practice or develop? BW: The students become more observant of the traffic situations they find themselves in. They learn to look far enough ahead to anticipate unwise actions of other drivers (situational awareness). As the students master the application of physics to drive their cars, they will make fewer unwise driving actions themselves. At select locations, we do a two-wheels off exercise and a tail gating exercise. In the classroom students learn about proper seating position and hand positions, mirror placement, the concept of the contact patch of their tires, the theories of weight transfer, the use of long distance vision and situational awareness. We talk about and address the challenges of distractions to the driver, be it the radio/iPods or cell phones for talking/texting, or just the simple cause of too many teens in the car. Where possible we stage a semi truck on site and stage cars around it to simulate highway driving and blind spots. We then have each student and all adults get into the cab and close the door to show how little the driver can see and how many of the cars are not visible to the driver. We also may explode an air bag to reinforce what they learn in class about hand placement on the steering wheel and to further drive home the fact that air bags are not soft cushion-like pillows but rather loud, exploding devices. LTK: What advice would you give to the parent of a teen driver who is concerned about driving safety? BW: I advise parents to ride with their teens as much as you can during and after their permitting phase. Any trip in the car ranging from going to the mall or school and back, in all types of conditions i.e. wet, dry, hot, cold, daytime and nighttime, country roads and interstates could prove to be a dangerous and life-altering trip. Have a set of rules for your teens once they get their license and if broken, make sure there are real consequences. Be a role model for your children. They are watching what you do a lot more than you realize; if it's ok for you, in their eyes it must be ok for them. That means no phone use when in the car and tell them why. NO TEXTING…… EVER! This includes work e-mails. Watch your speed, use your seatbelt every time and be sure to watch your tailgating habits and aggressive driving. As of Spring 2011, the Tire Rack Street Survival Program was not available in all areas.. Check out its school schedule to find a location near you. Parents interested in registering a teen driver for this program, at a cost of $75, can do so from the website.